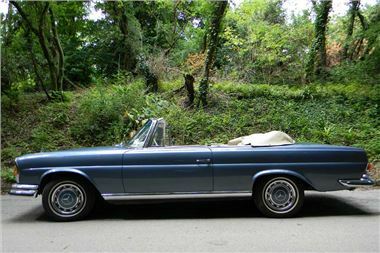 This highly coveted 1970 Mercedes 280SE 3.5 litre V8 convertible has been consigned for sale by Historics at Brooklands at their forthcoming auction on September 25th. The luxurious, five-seater convertible epitomises the Mercedes-Benz marque, with much sought-after styling mated to a high-performance 3.5 litre V8 engine, and is a fine example of why both demand, and price, is continuing to increase. This Lot is expected to fetch offers in the region of £70,000 - £90,000, some 10 times greater than its original list price of £7,249 at the time of its launch. Instantly admired, the 3.5 litre version of the 280SE was given stacked twin headlights and adorned with more chrome trim – in addition to the iconic oversized grille - to cater for its wider, bigger bow. With the car also sitting one inch closer to the groundthan the straight-six model, the 3.5 litre V8 boasts enduring good looks that have withstood the test of time. With the odometer showing just 21,981 miles from new, the car has benefited from much care and attention, with some £12,000 spent on meticulously maintaining the paintwork and a further £5000 invested on re-trimming the interior to an exacting standard.